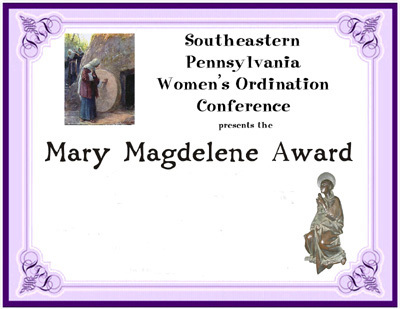 The Mary Magdalene Award was established in 2007. It is named after Mary Magdalene, who according to early Church fathers was the "apostle to the apostles," the female follower of Jesus who has been misrepresented and whose pivotal role in the early church was marginalized for since the sixth century. For these reasons, Mary Magdalene is considered by many to be the patron of women, particularly those claiming their rightful places, in the Roman Catholic Church. The first year (2007) the theme of Holy Thursday was "Be Not Afraid--Honoring and Celebrating People of Courage" and the award went to Eileen DiFranco, Judy Heffernan, Methodist Minister Karen Onesti, Methodist Minister Beth Stroud, Medical Mission Sister Mary Margaret McKenna, and Sister Falakah Fattah. In 2008 it was given to Arlene Swidler, 2009 to Roy Bourgeois and Karen Lentz, from the Philadelphia Catholic Worker, received it in 2010. Theresa Kane, RSM is the 2012 recipient. Gaile Pohlhaus received the award in 2013. Ceil Johnson is the 2014 recipient. Jenny Ratigan received the 2015 award. Rev. Robin Hynicka received the 2016 award. The following is a prayer from the 2007 award ceremony and witness for women's equality in Philadelphia. We pray: As we honor the courage of Mary Magdalene, let us remember that she was no different from us; that she was flesh and blood and fully subject to the tensions and conflicts of her own time. Let us likewise recognize, as she did, the persistent voice of the Holy Spirit who calls us out of our silence. May we listen closely to that voice, follow its commands, and surrender ourselves to God’s will, recklessly abandoning our self-concern, and joyfully embracing the challenge of a sometimes difficult road. We ask for the blessing of courage through the intercession of Mary Magdalene. Amen.